Most people don't give signs a second look or thought. Our goal is to change that all through this park. Hailey has been busy in the shop laying the paint and glazes onto the dimensional signs that will adorn the buildings. The signs are pretty special in our view. Chris, the owner of the park stopped in to the studio late last week to take a peek. He got excited... so much so that we are now looking at ways to feature the signs and make them MORE visible. Chris LOVES the signs. And no wonder for Hailey did a wonderful job bringing them to life with color. The Summit Trading Post sign is now finished and ready to hang. 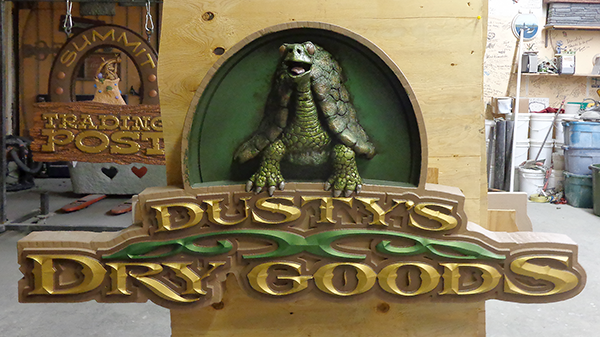 Dusty's Dry Goods sign is also almost done save for the pupils and highlights in his eyes. This sign too is so cool, colorful and FUN!